One of the experiences I treasure the most is my quiet prayer walk in a beautiful park. When tuned to heaven even the flowers speak audible words as I engage in conversations with the Lord. Its awesome and real. God’s glory is all around us, the blue expanse of the skies, the gold strips on the horizon, the galaxy, the stars, hmmm the list is inexhaustible. How can one describe the glory of God? I have pondered on this question for long. I asked a spiritual mentor and I was told to describe beauty and a basketball. Describing a basketball was easy, I have seen many before – a leather made, ballon like object that bounces when it hits the ground. To describe beauty, I struggled, I needed to see something beautiful. The glory of God is beauty, we see it daily but how do we capture the image and describe it in words. Often times our minds are filled up with the questions of living and we miss out on the entire experience. God is in a class by himself; His perfection, infinite greatness and distinct worth separates him from all things. One thing we have in common with God is our ability to desire a thing and communicate it in words and action. Everyone who is called by the name of the Lord, was created for His glory. To add more emphasis, I will say, we are created to showcase God’s glory. John Piper, in one of his sermons said, “the glory of God is the manifest beauty of His holiness; his holiness on display for us to apprehend”. How many times have we gone pass a flower, a tree or even looked at the stars hanging in the sky without acknowledging God’s glory. King David in Psalm 19:1 wrote, “The heavens declare the glory of God; the skies proclaim the work of his hands”; this is a deep revelation of how the heavens and the skies are shouting at us daily, “Behold, the glory of God!”. The same way the Lord desires our lives to reveal His glory. To showcase the glory of God involves our desire to be like Jesus. As we imitate Him, our hearts love him, trust him, becomes grateful and obedient. We are created in His image and we trust in His promises. We believe we are made for God’s glory and so our miracles will come and God’s name will be glorified in our praise reports. 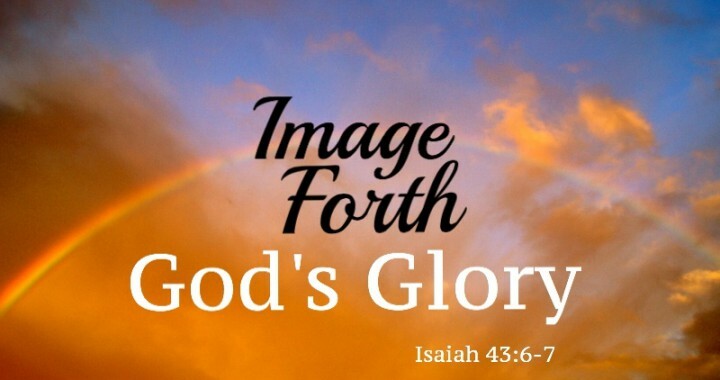 Our lives with image forth God’s glory. Posted in A New Spirit.